Moving" is the best way to describe what was experienced at the practice field at Eighth Street Middle School on Saturday. 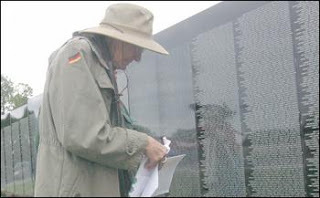 My friend, mentor, and "mama" teacher from ESMS, Susan Tucker, began planning to bring the Moving Vietnam Memorial Wall to Tifton several years ago when she wrote a letter to request to have it brought on its journey around the country. The Moving Vietnam Wall is a replica of the Wall in Washington D.C., and because of its journeys, many people who are unable to see the real thing are able to experience it in a nearby town. I must admit that I am by no means a "history person." My parents will tell you that when it came to that particular subject in middle and high school I (similarly to my mindset about multiplication tables) dug in my heels and decided that learning about wars and past presidents and all that other history "stuff" wasn't necessary. I regretted that decision when I arrived at UGA, majored in English, and discovered that English and history go hand-in-hand. However, it's just never interested me. As for the Vietnam War, I didn't know much about it. The only person I can think of that I knew that went to Vietnam was my Uncle Charley. It all happened long before I was born and just wasn't talked about much with my generation. When I began teaching 8th grade, my students had to read a short story called "Stop the Sun." It was a story about a boy whose father fought in the Vietnam War and was dealing with Post Traumatic Stress Disorder. I did a good bit of research for the story, because I felt that since I was unfamiliar with the subject, my students were probably even MORE unfamiliar. We did some work before reading so that we'd have a basis for understanding and I even used some of Susan's father's pictures to show my kids what things looked like. 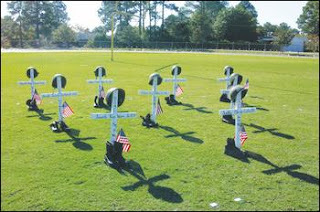 Long story short, Susan was able to bring the Moving Wall to Tifton. She has worked tirelessly to bring this gift to the city and I am so glad we were able to attend such a tribute. Today was the last day that it was in town, but I was able to attend on Saturday and see the memorial service for the ones from Tifton who died in the war. It was incredible to hear the stories of these families, feel their pain as they're all still mourning, and learn how far they'd come - just to be a part of the service. We spent several hours out at the field, listening to various stories, wandering past the wall and looking at the names, flipping through scrapbooks made for the soldiers. It was a great experience for me, because I was able to hear the families. I've been thinking about what to say about the wall since Saturday. Trying to decide how best to put it into words. You all know how much I talk, but I can't seem to find the right words to describe what I saw and felt at the wall. There are moments when things are just "right" in life. Friday it POURED down rain. It was extremely stormy outside. In fact, someone told me that Tifton got over 4 inches of rain. Friday was also the day when there was nothing "planned" at the Wall. Susan said people came out in the rain anyway, but no events were planned. Saturday, when I got up, the sky was a gorgeous blue, it wasn't too hot or too cool, and while I must admit that I got BLISTERED while outside, it was a perfect day. I have no words. While I haven't ever felt connected to that (or any) war - and I'm not complaining...I'm blessed beyond belief to not have a connection to that war or the one that's taking place right now - I felt connected on Saturday. 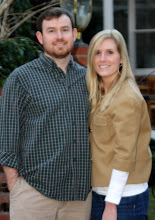 I can't describe what Susan was able to bring to Tifton - even if for a few short days. But I can say that it was a "moving" experience and allowed many people to come together that otherwise never would have. Thank you, Susan. Your hard work was worth it. It was an incredible day. Please sleep tomorrow.